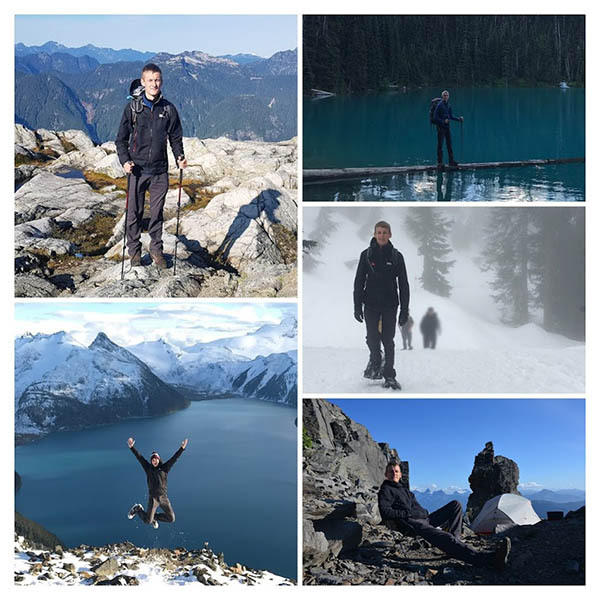 I started backpacking when I moved to Southwestern Canada three years ago. I usually spend my weekends car camping, day hiking or on 2-3 day overnight hikes in the area. I'm a gear junkie and I don't mind investing a lot of money into high-end gear which brings me joy on every trip. I try to be as light as possible without sacrificing comfort. My backpack usually weights 11-14 kg (24.25-30.86 lb) and after every trip I revise the gear I took and think of ways how to reduce weight even more. prAna Stretch Zion pants are lightweight and versatile pants for almost any outdoor activity. 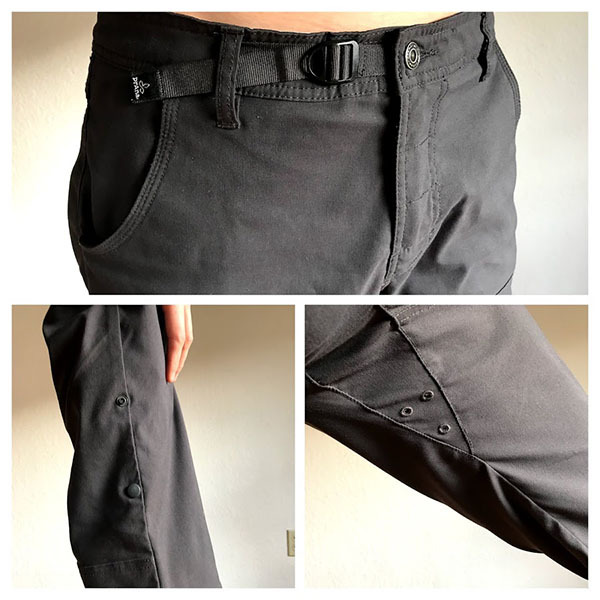 They are made of quick dry stretch performance fabric which is a blend of 97% nylon and 3% spandex and have DWR (durable water repellent) finish. This model comes in a wide variety of sizes and colors. 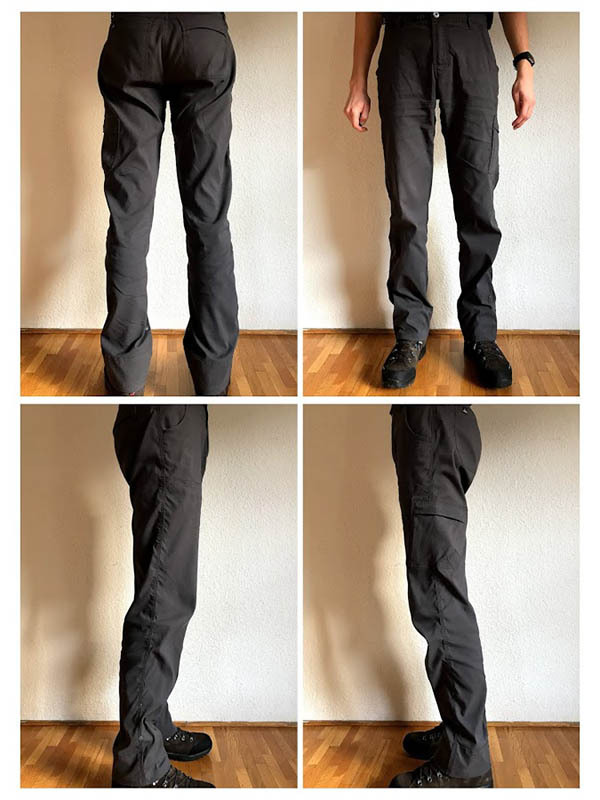 Waist is ranging from 28 in (71 cm) to 42 in (107 cm), inseam from 28 in (71 cm) to 36 in (91 cm) and they are available in 8 different colors (cargo green, coffee bean, dark ginger, dark khaki, mood indigo (blue), black, charcoal, mud). The Zion Pants material is soft, not noisy and comfortable to wear and they fit me well, they are not too tight and not too loose. They come with a waist adjustment strap as well as with belt loops which can be used for a belt or attaching carabiners with keys or other equipment. These pants breathe well and has six somewhat functional crotch ventilation holes as well as roll-up leg snaps which is handy not only for ventilation purposes but also when wading through streams. There are five pockets in total: two front, two rear and one on the left side. The open front and rear pockets are easy to access and are deep enough to hold various items without a fear of losing them. 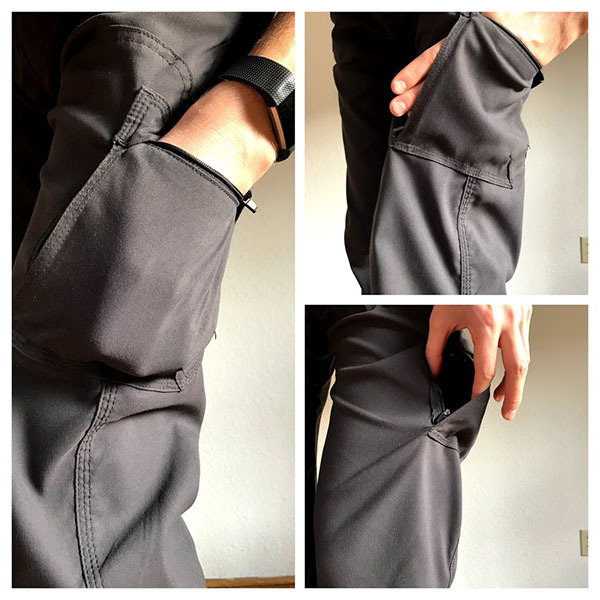 The side cargo pocket has two zippered openings - one on the top and one on the side. This is extremely convenient when I need to take something out while I'm sitting (especially while driving). Last but not least these pants offer UPF 50+ sun protection which blocks up to 98% UV rays when worn. I've owned these pants for over half a year already and I took them to over 20 trips outdoors. Most of the trips were either camping or hiking in Southwestern Canada mountains, one in Utah deserts and one week long backpacking trip in Cuba. The elevation ranged from sea level to 6600 ft (2010 meters) with the temperatures ranging from 21 F (-6 C) to 100 F (38 C). The weather conditions ranged from dry and sunny to pouring rain and snow. 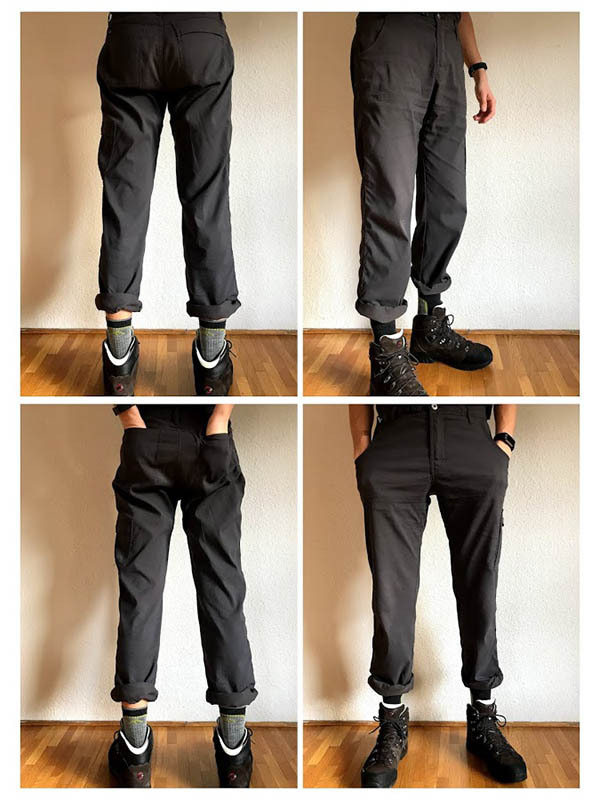 I wear these pants almost every day and I use them for almost everything: hiking, cycling, camping, snowshoeing and going out in the city. Walking down the canyon in Utah these pants were often rubbing against abrasive rock when I was trying to squeeze through narrow openings and to my surprise they handled abrasion really well. However in the Utah's desert and Cuba I often felt too hot in them even with rolled up cuffs and I had to switch to prAna Stretch Zion Shorts (their specifications are exactly the same as pants'). In light rain DWR coating worked great! It significantly limited water absorption and soaked through only in higher abrasion areas like the knees. In heavy downpour it soaked through but dried up much faster than my friends' pants. In colder conditions they performed great with merino first layer underneath and they didn't soak through even after sliding down several slushy snow covered hills without using any snow slide beneath me! prAna Stretch Zion pants offers freedom of movement no matter what I'm up to. The pants pack small and doesn't weigh much. It resists wrinkles and stains. It is abrasion resistant, holds strong and has no rips, tears or failed stitches after half a year of almost daily use. They look as good as dress pants and offer comfort of sweatpants. They can be used in casual settings, for traveling or general outdoor activities. I'm tall and slim guy and I had an extremely hard time finding pants which are less than 32 in (79 cm) waist with 36 in (91 cm) inseam length and which would actually fit me well. Although 36 in (91 cm) inseam model is available just in two colors (charcoal and dark khaki) I'm extremely happy with these pants. I can strongly say that these are the best pants I ever owned! This report was created with the BackpackGearTest.org Report Writer Version 1. Copyright 2018. All rights reserved.